Yesterday I was thinking of calls-to-action (CTAs) for a new Facebook Ad campaign I wanted to run, and I caught myself wondering why I was starting from scratch again. I mean, I’ve created and analyzed a ton of Facebook Ads. Why don’t I have a set of formulas I can go back to? 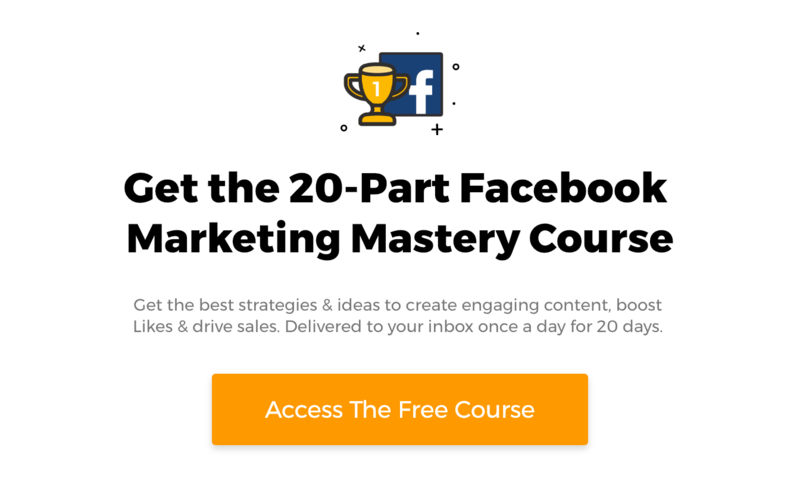 So I decided to create a list that makes for easy fill-in-the-blank Facebook Ad CTAs - not only for a catchy blog post, but to make my own life easier. I define an “effective” CTA formula as one that not only drives clicks, but also conversions on the Ad’s landing page. In this article I will show you formulas that can work for both News Feed Ads and Right-Column Ads, as I have found great success with both formats. If you’ve read 7 Facebook Ad Call-To-Action (CTA) Tips, Techniques & Best Practices, you know how much I love the stopping power of a great negative CTA. Negative words or phrases that tell a person they’re doing something wrong are great for getting people to stop and think about your ad. They’re also great for cutting through the clutter of every other Ad that’s telling you to “Grow Your Business” or “Be a Better You!”. Something about negativity just screams honesty, which I find refreshing. This is a similar formula to “Stop Doing [Blank]. It’s very negative, but in a different way. Instead of playing on people’s fears, it plays on their frustrations. It’s especially powerful when playing on people’s frustrations in trying to solve problems or improve their lives. For example, most people who try to lose weight will need to try a number of different diets or exercise programs before finding the one that works best for them. These people who are stuck trying to find that perfect method for themselves, after trying and failing on so many others, are an easy target for this type of formula. For this audience you could try a CTA such as “Sick of Fad Diets that Promise Unrealistic Weight Loss?”. This will get them thinking about all of the magazine covers and Ads, and their failure to deliver on such promises. Plus, since you’re empathizing with their situation, they’ll be more likely to find trust in you and click on your Ad. Here’s a B2B example that really resonated with me. I see countless online Ads from “online marketing gurus” for programs and training courses that promise me tons of leads and new sales for my business. So this is a perfect way to make me stop and think that this guy might be different, and entice me to click on the ad. Sick of Working at a Job You Hate? Tired of Sitting In Traffic Every Morning? Sick of Being Late on your Bill Payments? Similar to the “Free [Blank] [Report]” above, this is a perfect method to drive clicks and landing page opt-ins by providing something valuable for free. One thing I would say (IMHO) is that this is an even better way to get clicks from people who are the most interested in buying from you in the short-term. Free reports are great for getting leads at the top of your sales funnel, but coupons are able to bring in leads who are already closer to the bottom, and are more sales-ready. If a person claims a coupon, they are already planning on buying a product/service like the one the coupon is for. At this point they may simply be comparing prices, and your coupon can push them over the edge to buy from you. For this type of formula, think about the goals or desires of your target audience and position your product or free ebook/report as the solution. Test different synonyms for the word “want”, such as “need”, “crave” or “hungry for”. When you’re advertising or selling to new customers, the biggest barrier of closing a sale or conversion is trust. Before someone will give you their email address or (if you’re lucky) their credit card information, they have to trust you. On the internet this can be hard. But one of the best ways to build trust in people is with a quote or recommendation from someone that they, and a lot of other people, trust: an influencer. An influencer is someone whose opinion is sought after in a particular industry. They have established themselves as a credible, go-to source on issues, new developments or best practices. This Ad from Scribd used the formula perfectly, with “See why Wired Magazine calls Scribd the “Netflix for books.”” I’m a tech nerd so both Wired and Netflix were great for creating trust and an obvious understanding of the service. Nothing gets a person more engaged than the chance to win a big prize. A contest is one of the best landing pages to promote with a Facebook Ad. It creates HUGE desire in people to click, which can be difficult for Facebook Ads that can’t count on the “intent graph” that Google Adwords runs on.